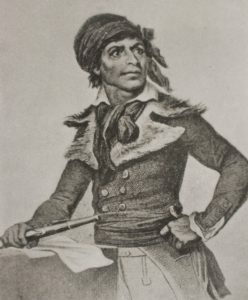 On a hot summer day in Paris, concealing a butcher knife in her long skirts, Charlotte Corday appeared at the gates of Jean-Paul Marat’s house. She told the guards she had names of Marat’s enemies – for the guillotine. And she would give them to no one but Marat. His wife had a bad feeling about the beautiful young noblewoman. Marat overrode her concerns. Charlotte was led into the bathroom, where Marat, who suffered from a horrible skin condition, was soaking in an herbal bath. As she gave Marat the names, he carefully wrote down each one down. When the list was finished, Charlotte pulled out the knife, lunged, and stabbed Marat near the heart. He called out for his wife, but quickly bled to death in his bath water. Why had Charlotte, 24, done this? 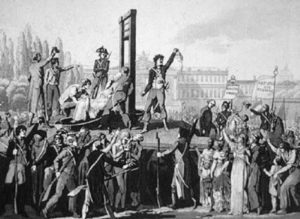 That summer of 1793, Marat and Maximilien Robespierre, crazed with bloodletting, had begun guillotining Girondists, who were trying to be the voice of reason during the French Revolution. 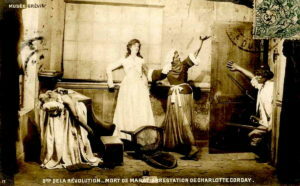 Charlotte sympathized with the Girondists and hated that Marat was using his newspaper to stir up hatred against them. Charlotte believed that with Marat dead, the killings would stop. She was captured before she could get out of his house. They tortured her for four days, trying to get the names of all involved in the plot but there were none – Charlotte had acted alone. On July 17, Corday was guillotined. Robespierre didn’t fare much better. One year later, almost to the day, he, too, was guillotined. How many died in the French Revolution? More than a million people, including King Louis XVI and his consort, Marie Antoinette, but most of them were peasants. 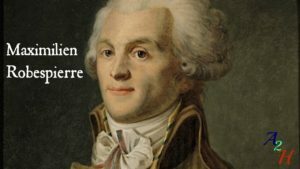 Charlotte’s friends said she had made a mistake – she should have killed Robespierre. The French Revolution is so difficult and complicated to study adequately, but I suspect your number of a million dead is too high. Professor Marissa Linton of Oxford lists 40,000-50,000 either executed or died in jail and another 250,000 in the civil war that followed the Revolution. That’s a huge number, but only a third of a million. There were some foreign wars going on at the same time, notably an invasion by Austria, but should those deaths be considered revolution deaths? It’s hard to know. Since this is history gossip, I chose the highest estimate. A huge number of peasants died, something not commonly known, since the emphasis is often on the nobility who were guillotined.